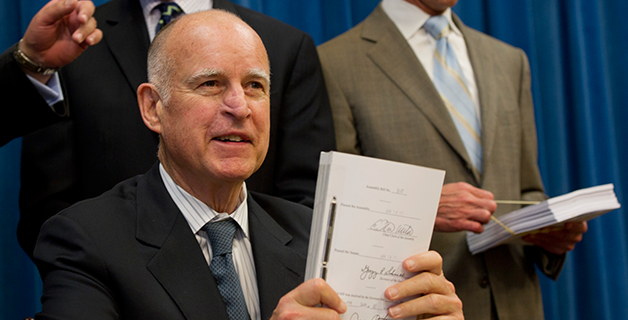 Governor Jerry Brown signed the 2014 – 2015 California budget today, Friday, June 20, which includes a $30 million investment in the futures of foster children who are raised by relatives. This is the most important policy victory for foster children since the extension of foster care to age 21 through AB 12 in 2012. The Approved Relative Caregiver Funding Option Program will allow counties to provide state foster care funding to foster children who currently receive CalWORKs benefits. Counties have to opt into the program by October 1, 2014 in order to get the funding from the state and the program specifies that the state will cover 100% of the cost of the program for the existing population of foster children placed with relatives. For the counties who opt in, the program will become effective January 1, 2015. California has prioritized the placement of foster children with relatives for years, and with this budget move, it is now also prioritizing stability in those placements. 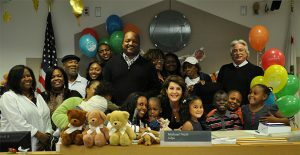 Thanks to the intense leadership of the California State Assembly, the Department of Social Services, the philanthropic community, Governor Jerry Brown’s office and the efforts of the Step Up Coalition, led by the Alliance for Children’s Rights, counties have, for the first time, the opportunity to provide relative foster parents with the support they desperately need. In turn, this will lead to greater stability and improved long-term outcomes for these children. Research demonstrates the value of placing children with relatives. The most recent edition of the Stuart Foundation’s Invisible Achievement Gap found that students placed with kin often did better than their peers in other placements. Similarly, students in kinship placements were the most likely of foster care grade-12 students to graduate from high school. Conversely, foster youth in group homes were the least likely to graduate. Youth whose relative placements fail often get placed into group homes, which, on average, cost the state $100,000/year per youth. Relatives will now receive, on average, $9,800/year, to provide for the foster child in their care. Equitable financial support is good news for the 36% of California’s nearly 60,000 foster children who are in the care of a relative. If counties opt into the program, this vulnerable population will now receive state foster care funding of around $820/month (for a 15 year old), which is what U.C. Davis found to be the minimum amount of support necessary to provide for a child’s basic needs. Currently, many children placed with kin are given around $369/month through CalWORKs, which barely makes a dent in meeting the essential needs of children. This causes families to struggle, especially grandparents living on a fixed income. California leaders have made an extraordinary investment in children who, without proper support, are at risk for lifelong poverty, homelessness, low educational attainment and unemployment. The decision to make the program a county option is consistent with the Governor’s realignment of California’s child welfare system. 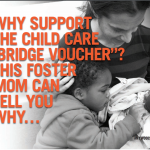 The onus is now on the counties to take advantage of state foster care funding for relatives by opting into the program by October 1, 2014. Counties who opt in will receive 100% of the funding necessary to provide foster care benefits to all of the relatives currently caring for children in foster care. 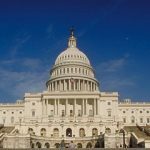 Review the budget here (see section 11461.3). This would not have happened without the support of the Budget Conference Committee members: Assemblymembers Shirley Weber, Nancy Skinner, Richard Bloom and Jeff Gorrell, and Senators Loni Hancock, Jim Nielsen, Mark Leno and Ricardo Lara. 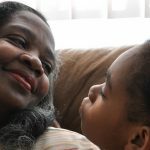 This entry was posted in Legislation, News, Step Up Coalition and tagged Approved Relative Caregiver, CalWorks, Invisible Achievement Gap, Jerry Brown, kinship, Pegine Grayson, Shirley Weber. Bookmark the permalink.